Pepco surprised a D.C. girl with a hamster! A little girl in D.C. thought she was writing the pet supply store Petco a letter asking for a hamster. She accidentally sent her request to Pepco, the D.C. utility company -- but Pepco gave her a hamster anyway. Pepco surprised the 8-year-old girl, named Serenity, with a hamster in downtown D.C. on Friday. Photos show her smiling with her new pet and her family. She recently wrote Pepco with a "firm, straightforward request," the company said. She wanted a hamster. "If I reseive a hamester, I will do better in school, make more friends, and become responsible," the second-grader scrawled. Lest her point be missed, at the bottom of the letter, she drew a bucktoothed hamster that took up half the page. Pepco doesn't usually give away pets, but they decided to make an exception for Serenity. 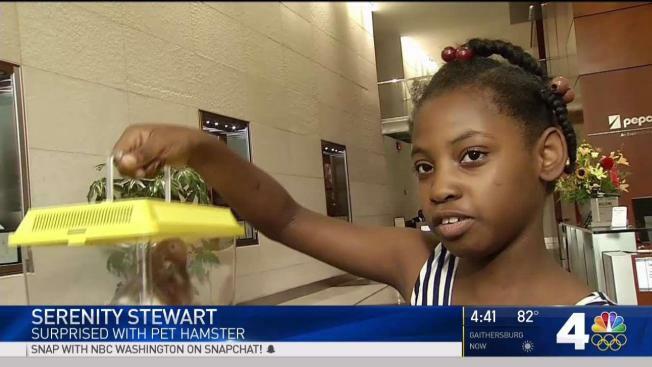 She got her very own hamster late Friday afternoon at Pepco's headquarters on Ninth Street NW. She named it Brick Hamster.